Welcome to our guide to lifting the 2007-2107 Silverado/Sierra! Whether you’re looking to improve ground clearance, run bigger tires or just want to make your truck look better overall by lifting it, this is for you. 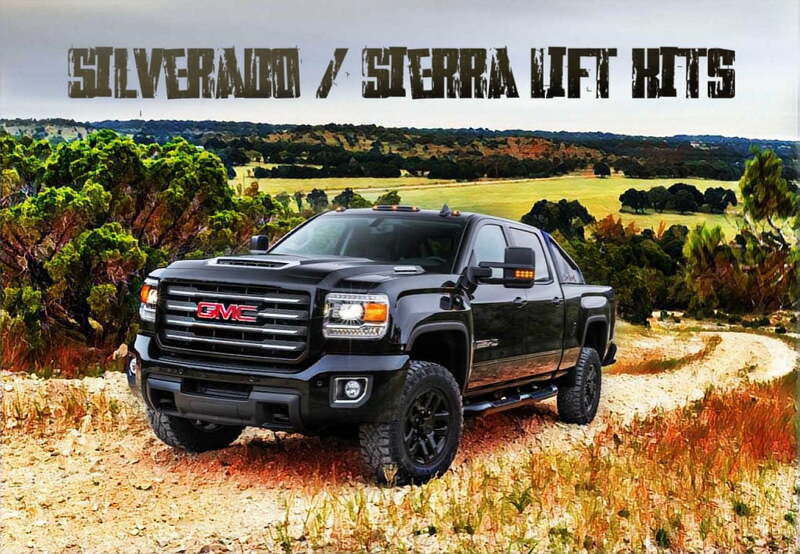 This guide will help you compare your options as we take a look at the most popular kits for lifting Silverados and just how they work to give your truck some altitude and attitude! We’ll start with leveling kits that raise the front only, and then go over the options for even more lift, all the way up to some of the highest lift kits available. As you can tell from this picture, from the factory these trucks have a forward rake to the way that they sit. It’s about a 2 – 2.5″ inch difference, meaning the front of the truck sits about 2″ lower than the bed. If you’re looking to get rid of or reduce the factory rake, and make your truck look a lot more aggressive without compromising in ride quality, a leveling kit is what you want. This kit by Rough Country is the best option for leveling the 1500. Made from durable delrin, it’s designed for longevity and corrosion resistance, which means you can rest easy knowing that it will probably outlast the rest of your trucks suspension. The reviews show nothing but people that are happy with their purchase of this kit. On the rare occasion that anyone has less than stellar things to say, it usually comes down to an error during installation. 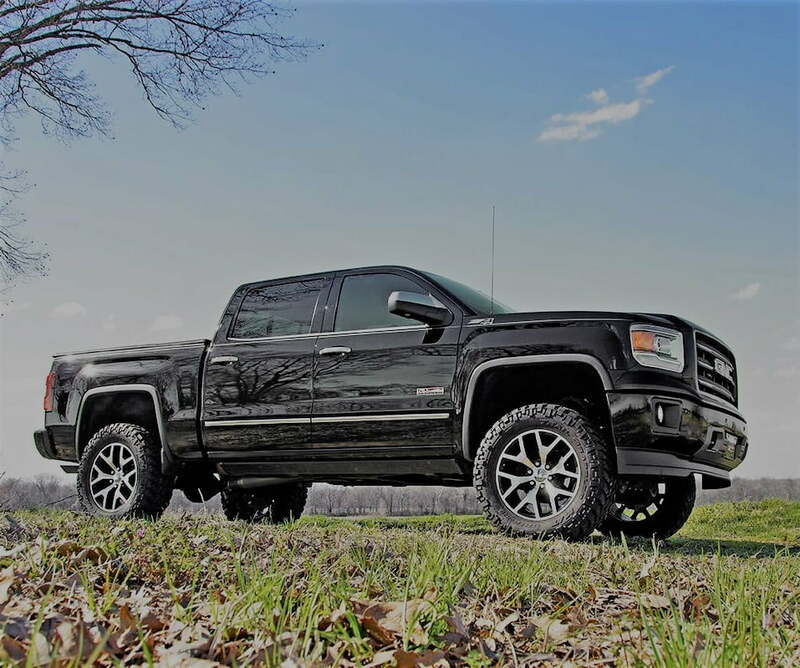 Rough Country’s claims of easy install and 2″ lift are confirmed by multiple Chevy/GMC 1500 owners. Unbolt the two lower strut mount bolts and the sway bar. Pry the lower control arm down enough to slip your new spacer in between the lower strut mount and the LCA. Install the new longer bolts and torque to spec. That’s it, you’re done! The 2500HD and 3500HD Silverados will need a different type of lift for the front suspension, as these trucks are heavier and are designed to carry more weight than the suspension setup on the smaller and lighter 1500. These trucks use a torsion bar type suspension setup for the front, which can actually be adjusted to lift your truck in stock form already, although cranking the torsion bars up with factory keys does make your truck ride rougher. 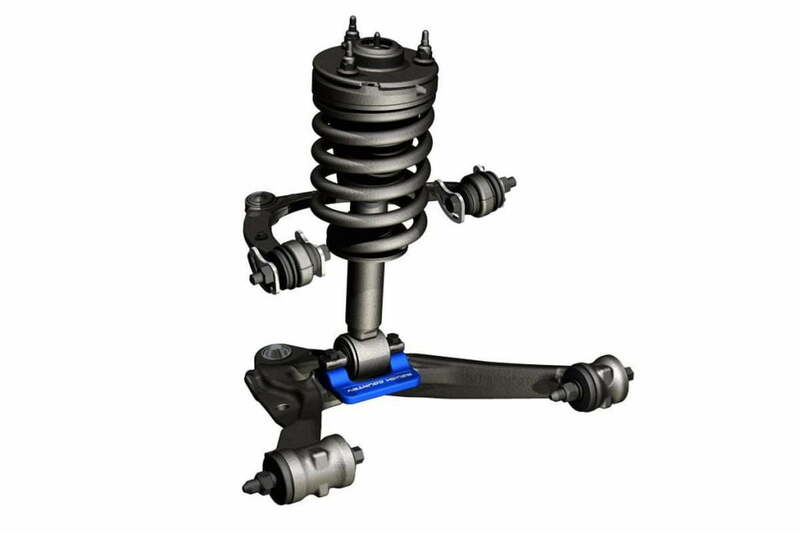 The reason to get a lift kit for this suspension setup is that while its possible you can adjust the ride height in a stock torsion bar setup, you are still limited in the range that the factory torsion bar keys allow. 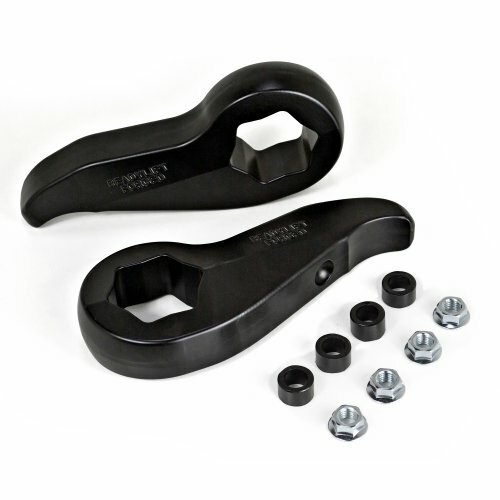 This kit replaces the factory torsion keys with a set that moves the point of adjustability up the scale, so that your range of adjustment starts with a higher lift point at the minimum torsion setting. These keys allow you to have a higher lift potential (up to 4in higher) all while maintaining the factory ride quality. If your goals area bit higher, like wanting to fit 35″ tires, then you’re gonna need to a lift kit that gives a little more height than just a front leveling kit would. This is where a 3.5″ lift kit comes into play. The higher lift will give you the space that you’ll need in the wheel wells (with maybe some minor trimming) for larger tires up to 35’s, while also increasing your ground clearance over obstacles. 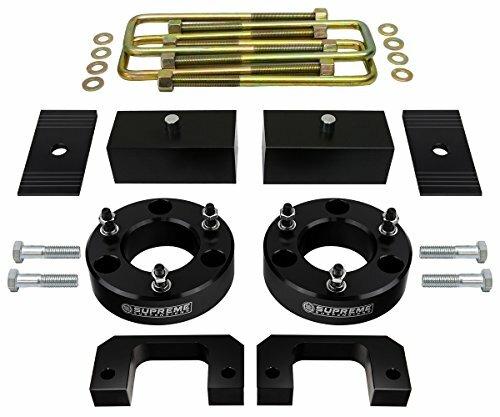 The best 3.5″ kit for the 1500 is this one by Supreme Suspensions. It has everything you need to lift without affecting ride quality. It includes the lower spacers like you saw in the previous leveling kit, and adds a spacer for the top of the strut assembly, which gives you the extra lift. Splitting up the spacers like this is a very good idea, as you don’t want to have too much of a spacer on one end of the strut, as that would affect the suspension geometry. 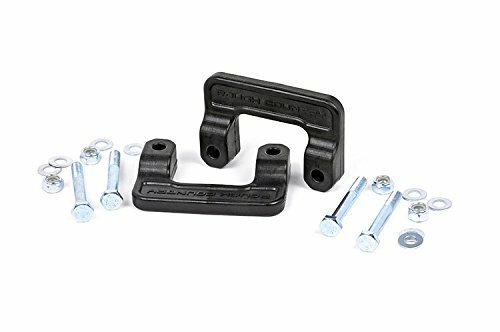 The kit also comes with the blocks that you need for the rear lift to match the front, and the extended u-bolts that you’ll need when adding blocks to the rear leaf springs. Also included is a differential drop kit, which keeps the front axles at a better angle, to prevent them from wearing out faster than they should. FITMENT: "New Body Style" 2007 and 2008 - 2017 Chevy Silverado 1500 + GMC Sierra 1500. CONTENTS: 4x Aircraft Billet Strut Spacers, 2x Solid Billet Blocks, 4x Zinc Plated U-Bolts, 2x Axle Pinion Alignment Shims, Installation Hardware, Installation Instructions and Pro Pack. TECHNICAL NOTES: 3.5 inch front suspension lift and 3 inch rear lift. Fits 1500 6-lug model configurations only. BENEFITS: Improves the look of your truck and increases ground clearance, allowing you to fit larger custom rims and tires. Factory shocks can be reused. Solid sheer strength and light weight lift material CNC machined from Aircraft Billet. INSTALLATION: Easy bolt-on installation takes 2 - 4 hours. No special tools are required. This Supreme Suspensions 2007 - 2017 Chevrolet Silverado 1500 lift kit is precision engineered to provide an adjustable 3.5" front and 3" rear suspension lift for Silverado 4WD models. 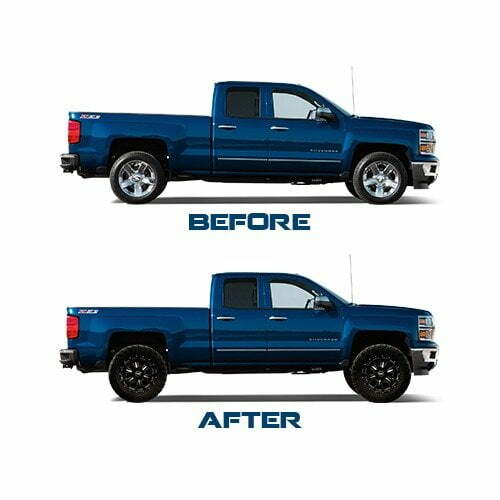 As a Silverado lift kit, its the fastest and easiest lift kit to install to increase ride height and ground clearance, so you can fit larger custom rims and tires. 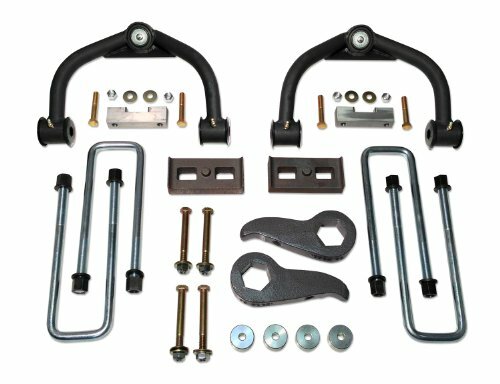 This lift kit for Silverado maintains your smooth factory ride quality and improves the look of your Silverado. Installation takes 2-4 hours. An alignment is always recommended after altering the height of your vehicle No special tools are necessary for installation. Supreme Suspensions Pro-Billet Series is precision CNC machined from solid blocks of T6 Aircraft Billet, the best material to use when lifting your truck due to its sheer strength and lack of weight. Each piece receives a special anodized coating for a superior finish to protect against rust and corrosion. Unlike steel kits that are cut-out and welded together, our Pro-Billet Series is built from a solid block and will not compress or warp under extensive load. This kit also includes a pair of rear axle shims to ensure optimal pinion angle and prevent unwanted vibrations. All of Supreme Suspensions products are developed and rigorously tested by in-house ASE certified specialists, in conjunction with sponsored, professional racers as well as dealerships across the US. 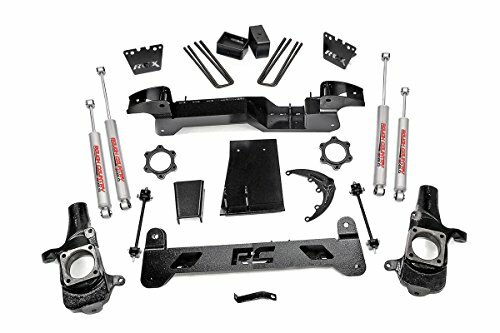 This 07 - 17 Silverado 4x4 lift kit includes: 2x Pro-Billet Upper Strut Spacers, 2x Pro-Billet Lower Strut Spacers, 2x Rear Axle Shims, Installation Hardware, Installation Instructions, and Supreme Suspensions Pro Pack. 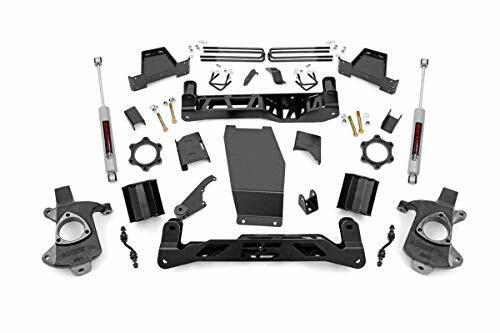 This Tuff Country kit is the most comprehensive and best overall 3.5″ lift kit for the 2500HD and 3500HD Silverado/Sierra. Tuff Country ensures that they produce a high quality kit by keeping the manufacturing in-house in the USA. They powdercoat all applicable parts for longer durability than cheaper painted parts. The limited lifetime warranty is another indication of how they stand behind their products. The kit is designed for ease of installation, no cutting or welding is required, simply bolt on the replacement parts in place of the factory stuff. Lift kits are designed to add additional height to your truck or SUV to increase fender clearance and allow for larger tires. Tuff Country EZ-Ride Suspension has been producing suspension lift kits since 1988. All Tuff Country lift kits are engineered for the finest quality at an affordable price. Simple installation and a great ride are a trademark of the our kits. All lift kits are backed by a limited lifetime warrantry. If the 3.5″ lift is just not enough for your truck, or you want to run even bigger wheel and tire combos, then you’re going to need a more serious lift kit. 6″ kits have much more ground and wheel clearance, but there are also alot more parts to replace when going this route. Below are the comprehensive kits that include everything needed to give you the big lift that you’re looking for. Can run factory 20-inch wheels. Provides highly sought level stance. High clearance crossmember design gives unmatched ground clearance. 100% precision laser cut materials using the latest computer aided design process. Fabricated blocks are stronger and offer a longer lifespan than cast blocks. Includes application valved N3 series shock absorbers which offer the best in balanced performance for on and off-road use. Requires cutting and drilling. 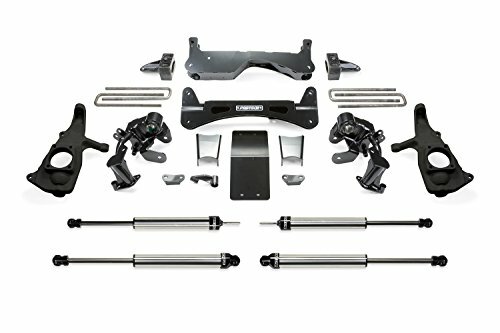 Does Not fit Hybrid eAssist models Does Not fit models with stock Cast Steel control arms Does Not fit GMC Denali models with Magnetic Ride Control. If wider than 295 60R20 tires are used, offset wheels will be required and trimming may be required. 18-inch or larger wheels are required. If truck is equipped with a mass damper on the front differential, the damper must be removed. We hope this guide has helped you to decide which kit is best to buy for lifting your truck. If your have any questions, comments or concerns, feel free to reach below.